"We have a day off, like a holiday." I moved to Alabama on a Fulbright scholarship two years ago. I was very excited to see the presidential election up close. I didn't realize how&nbsp;different elections are here&nbsp;from in my home country, Indonesia. I was&nbsp;very surprised by how low voter turnout is in America. Even though I'm not a US citizen, I care about what happens here, especially in Alabama, and I hope you'll promise me&nbsp;that you'll vote this time. Stevie & Matthew, Director: Esther de Rothschild, Camera: Nicky Montalvo & Angelica Perez, Sound: Julian Cabrera, Color: Natacha Ikoli. 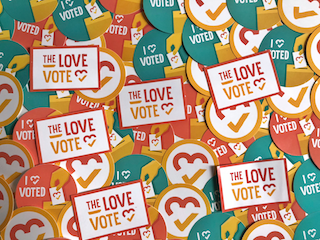 Show Stevie love + inspire others + get voting info + get event invites + get stickers + create change!